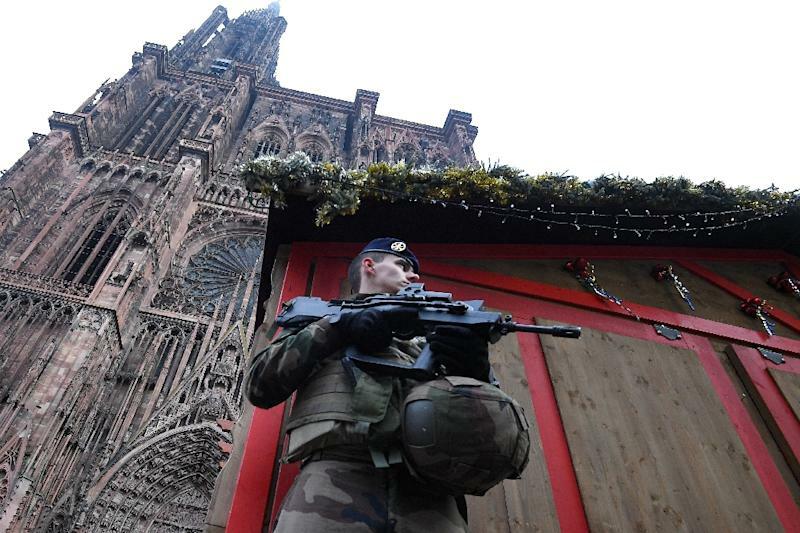 Strasbourg (France) (AFP) - Hundreds of French anti-terror police are hunting for a fugitive gunman who attacked Christmas shoppers at a market in the eastern city of Strasbourg while shouting "Allahu akbar" (God is greatest), officials said Wednesday. The attack in the heart of the medieval city as the annual Christmas market was closing on Tuesday night left two dead, 13 injured and crowds of traumatised witnesses. The suspect, a 29-year-old Strasbourg native identified as Cherif Chekatt, opened fire with a handgun and stabbed passers-by during his rampage, France's anti-terror prosecutor Remy Heitz said Wednesday. Chekatt, who was on a watchlist for suspected religious extremists, had already been sentenced 27 times in France, Germany and Switzerland for crimes including violence and robbery. His mother and father, as well as two brothers, were detained for questioning Wednesday. Chekatt was flagged by French security forces in 2015 as a possible extremist while in prison, after he "called for practising a radical form of religion," deputy interior minister Laurent Nunez told France Inter radio Wednesday. He lived in a rundown housing estate a short drive from the Christmas market, which draws some two million people each year to its wooden chalets selling festive decorations, mulled wine and food. 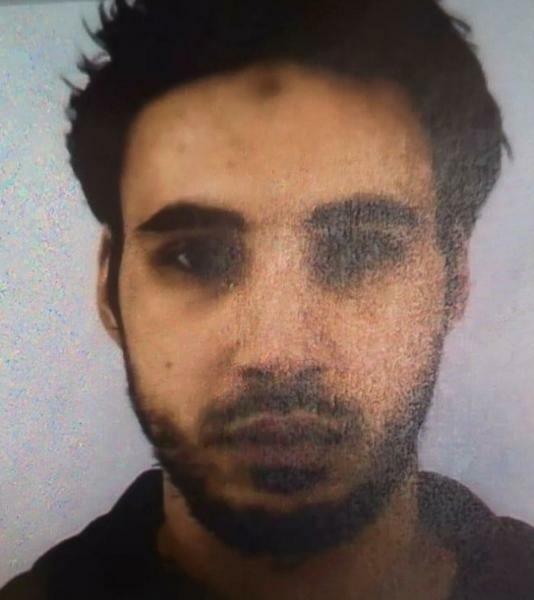 "His family has lived around here for a while, but he lived on his own nearby," Zach, a 22-year-old in the Poteries area of Strasbourg, told AFP. "He was discreet, not a thug." Much of the centre of the city as well as the European Parliament building were locked down through the night as teams of police and soldiers searched for the gunman. On Wednesday, the market was shut and theatre performances and other shows were cancelled as reinforcements joined a manhunt that also involved police in neighbouring Germany. Interior Minister Christophe Castaner told lawmakers in Paris that three people tried to stop Chekatt, one of whom was stabbed but not killed. During his rampage, he was injured in an exchange of fire with soldiers who were patrolling the Christmas market as part of regular anti-terror operations. The gunman then fled the scene in a taxi, getting out in the city's southern Neudorf district, where he again exchanged fire with police before disappearing, a source close to the inquiry told AFP. Around 720 police officers and other security forces are searching for him, Castaner said, and the public is being urged to alert police of any tips on his whereabouts. The government has raised the security alert level for terrorism to its highest, reinforcing border controls and patrols at all Christmas markets across France. Prime Minister Edouard Philippe announced Wednesday that France's anti-terror Sentinelle operation, which counts around 7,000 soldiers, will be boosted by a total of 1,800 troops over the coming days. 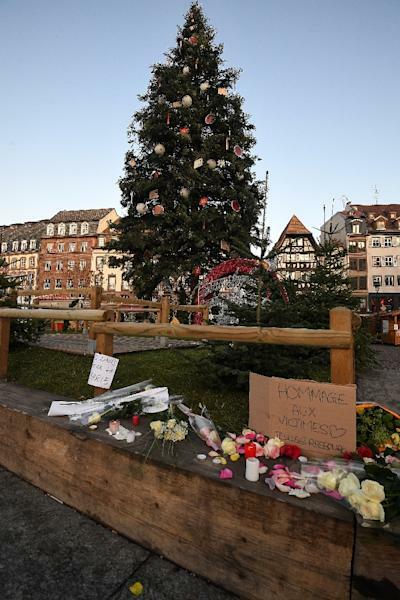 Among the victims in Strasbourg, two were killed outright and another has been declared brain-dead, while 12 more were injured, six critically, Heitz said. The shooting spree comes as French leader Emmanuel Macron faces the biggest crisis of his presidency after three weeks of anti-government demonstrations sparked by fuel tax rises. Security forces were already stretched by the often violent demonstrations during which five people have died and more than 1,400 been injured. Police had wanted to arrest Cherif on Tuesday morning as part of an investigation into a robbery gone bad and an attempted murder, Nunez said. He was not at home, but police found a grenade, four knives and a loaded .22 calibre pistol. Strasbourg mayor Roland Ries said most of the victims were men, including one Thai tourist who was among the dead. In Rome, the foreign ministry said one of the injured was an Italian journalist covering the European parliament, but did not confirm media reports that he was in a serious condition. According to a tweet by Poland's embassy in Paris, a Polish citizen was also among the injured. The market was to remain closed Thursday, city officials said. France has been targeted by a series of attacks by Islamist gunmen since 2015, and the Strasbourg market was long considered a target. Strict vehicle restrictions, security checks and patrols by armed police and soldiers amid the revellers have become the norm. The SITE intelligence group, which monitors jihadist activity, said in November that a group aligned with the Islamic State group had warned of a Strasbourg attack with a social media post titled "O Christmas here we come - Strasbourg, 01 January 2019." Some 25,000 people are currently on France's "S" extremism watchlist, 9,700 of them for radicalism "linked mainly to Islamist terror movements," according to the interior ministry. Most recently in France, a 20-year-old Chechnya-born man went on a knife rampage in central Paris in May, killing one person and injuring four. At least 245 people have been killed in terror attacks in France since 2015, according to an AFP toll.